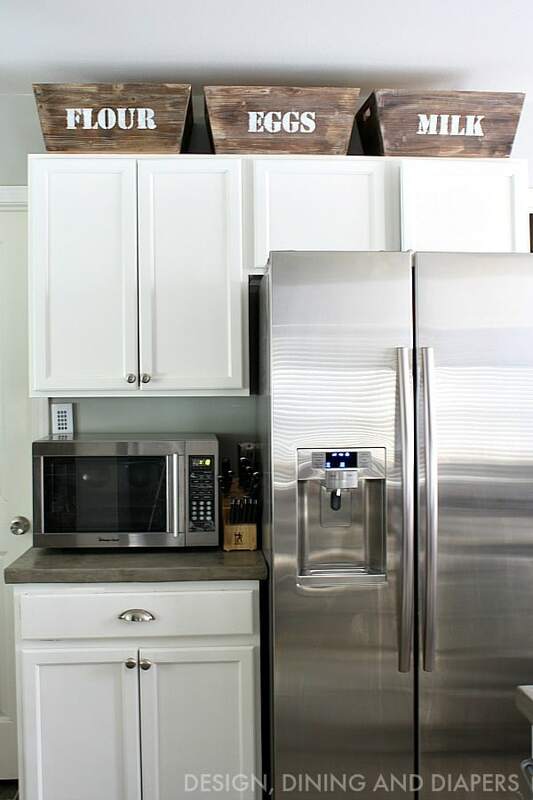 Let’s talk today about decorating above kitchen cabinets. In my current kitchen, this isn’t an issue, but it was definitely an issue in the townhouse we used to live in. The tricky part about decorating above cabinets is that the space is usually fairly large, so small items tend to get lost visually. 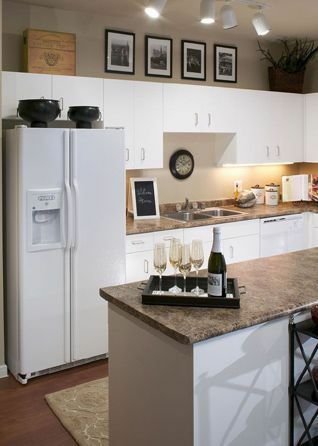 Also, because the space is so high, you wouldn’t want to put items above cabinets that you use often. In the 90’s, faux foliage was all the rage above cabinets, but I’d like to think we’ve come up with more aesthetically-pleasing solutions since then. Is there anyplace where baskets are not a good idea? I’m pretty sure the answer is a resounding no. Best of all, baskets are inexpensive, readily available, and give you more storage space, too. 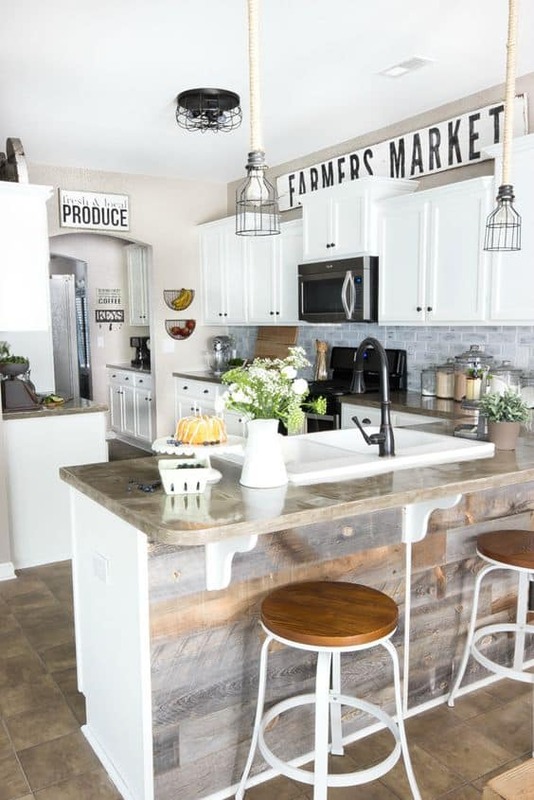 Love the clean look and farmhouse-feel these baskets give this space. 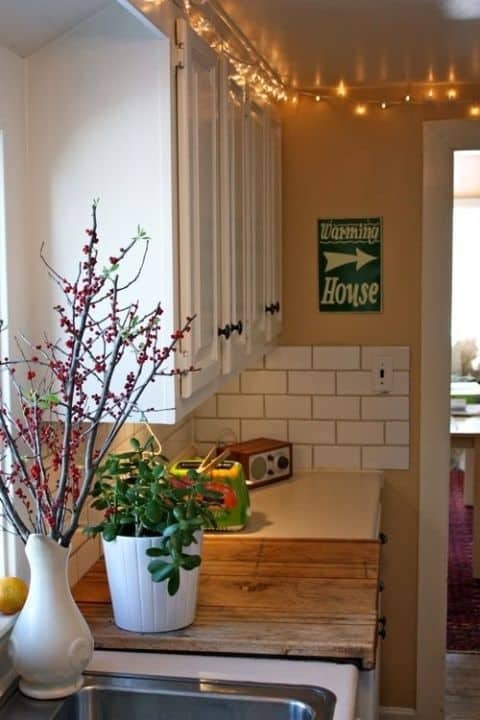 LOVE the idea of placing vintage-inspired signs above cabinets. 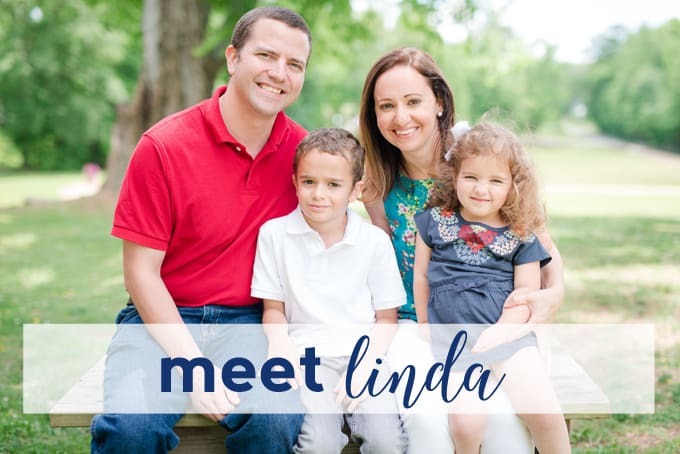 You can make one yourself, or shop Etsy for a great selection. “Farmhouse”, “home sweet home” and “gather” are all popular phrases. 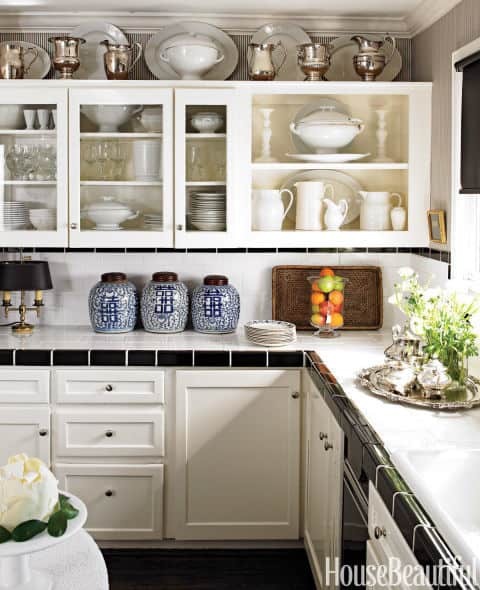 Wire baskets are another great above-cabinet solution. These appear to be holding alcohol, wine and other less frequently-used items. Have a treasured collection? 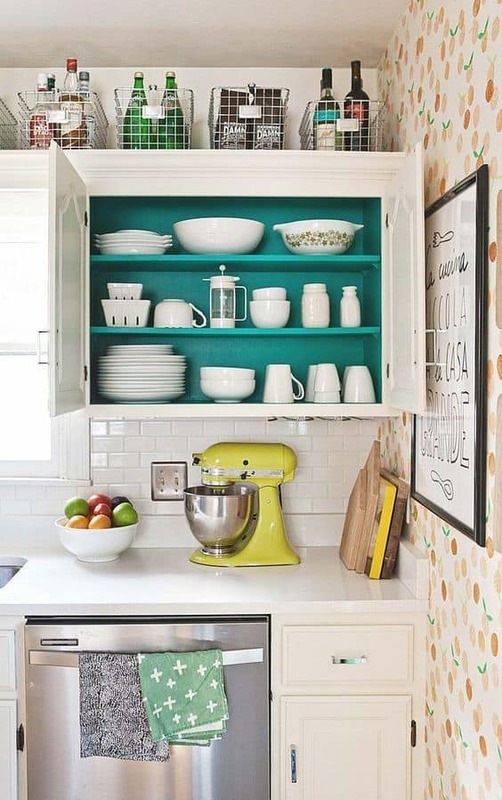 Whether it’s ceramic plates, pitchers, or any other kitchen-related collection, consider using the space above your cabinets to show it off! Just make sure there is something that ties all of the pieces together, whether it’s a color, material or specific period of history. I would never have thought to use framed art above the cabinets, but I love the look! 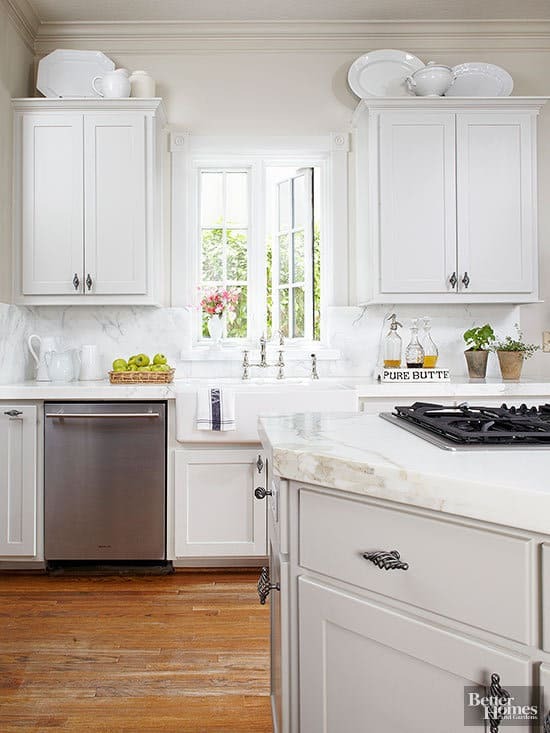 These black and white photographs add a timeless feel to this kitchen. Combining a couple collections, in a couple different finishes, gives this space a collected and eclectic look. 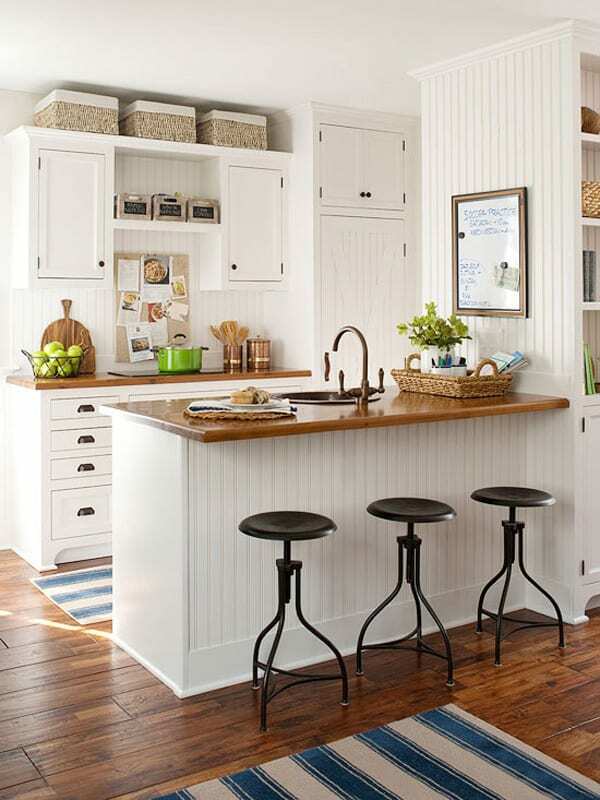 How FUN would it be to string lights above your cabinets? Not just for the holidays, these lights add a fun ambiance to this space. 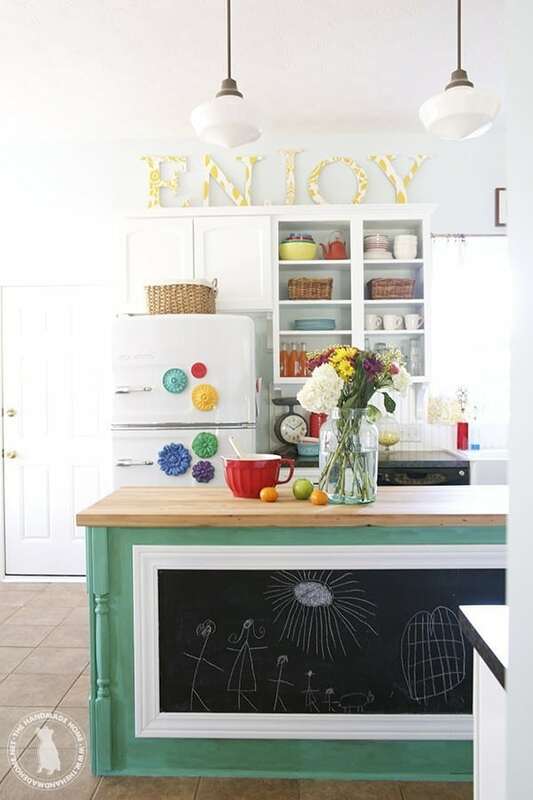 Decorative letters, which are easily bought in any craft store, can be painted, mod podged, or just left plain to add a fresh and modern feel to your kitchen. You can easily toss less-used items, such as linens and holiday decor, into these wooden crates, making them functional, and not just decorative. What did I miss? If you have a great decorating idea for above kitchen cabinets, I’d love to hear! 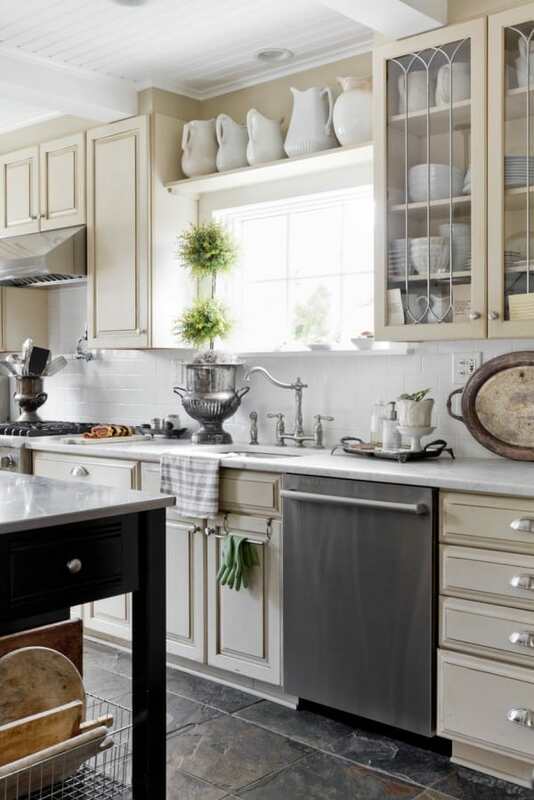 Thanks for reading all about decorating above kitchen cabinets! Have a great day!